Episode 10: The Music Man - A Reel Education: The Musical! 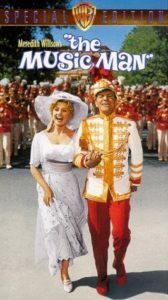 This week, listeners, Mike discovers and Vinnie re-discovers the sweet, simple (yet sly) joys of THE MUSIC MAN. Robert Preston stars as Professor Harold Hill (spoiler: not his real name) in the role that made him a Broadway star, and defined both the role and his career. His charisma and energy is the unstoppable force that throws the entire town of River City, Iowa into an uproar. 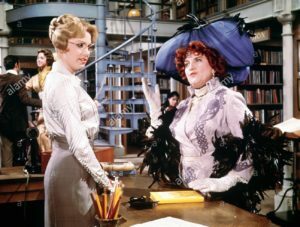 Standing resolutely firm and throwing some old-timey side-eye is Marion Paroo (Shirley Jones), old maid librarian and the town’s music teacher. Shirley Jones adds warmth and intelligence to a role that could seem trite and cliched. 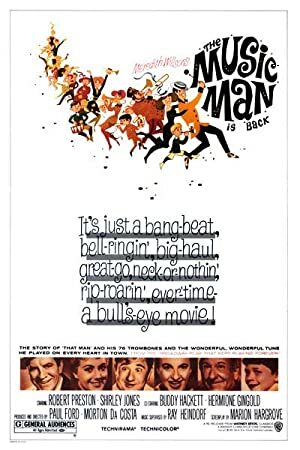 Joined by Buddy Hackett doing…whatever it is only Buddy Hackett can do, a barbershop quartet, and the biggest hats we’ve yet seen, this movie races by faster than Robert Preston’s patter. It’s tuneful (with a capital T! ), funny, and heartfelt – a classic for a reason. Don’t wait for the Wells Fargo Wagon – take a listen now! I must avert my eyes from The Hat. Plot: Harold Hill poses as a boys' band leader to con naive Iowa townsfolk.